Combo stool and side table, my new little red stool comes from a trip to the the Brooklyn flea. I just love the cool red patina on this funky little piece. It doesn’t take much to make me happy. Harry just can’t contain himself or the boys from digging into dessert before the salad! 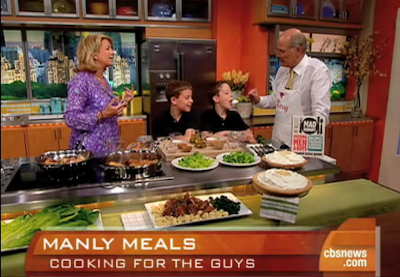 Click to watch the full segment on CBS of cooking with boys and men.